"Early to bed and early to rise, makes a man healthy, wealthy and wise", a well said famous phrase by Benjamin Franklin. I am sure this phrase had a lot of meaning then, but is it relevant these days? Does it still hold the same value? So, I looked up on the benefits of getting up early and it amazed me so much that I wanted to share it with you all. If you really take some time out to wake up early on one day and take a look around you, you would be surprised to see a good number of early birds. They consider waking up early as a golden rule in their lifestyle. We all know that exercise in the morning gets your metabolism going, but it also releases endorphins and makes you feel fantastic as you cruise through your daily routine. Waking up early is the key to having a healthy lifestyle and success in life. It helps you to end your day earlier. Fewer worries about what excuse you will have to come up with to explain to your boss why you're late again. Waking up early gives you time to eat breakfast and to prepare your food for the day. There is improvement in sleep and eating habits. You get good quality time for your workouts. Waking up early benefits both mental and physical health. Now you are aware of the benefits. Here are some quick tricks to get you out of your bed. Try implementing as many of these tips as possible into your lifestyle to start seeing those remarkable changes! Avoid eating late night dinners. Make sure you eat two hours before you go to bed. Turn off anything that distracts you prior going to bed. Dim the lights, get yourself relaxed and listen to some soft music or read a book. Set your alarm few minutes ahead. Try not to disrupt your schedule. Try to fall asleep and wake up at the same time every night. Limit your coffee intake to 2 cups/ day. Caffeine might interrupt your sleeping patterns and may keep you awake and hinder your sleep. 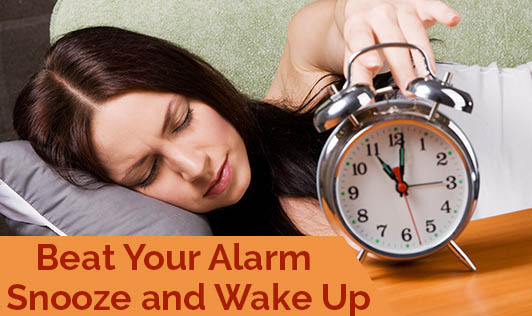 Have a loud alarm and avoid hitting the snooze button. Remember, waking up early takes time to turn into a habit. However, remember that, this habit will give you more time for yourself, give you time to get your job done, and manage your day ahead. Yes, it's a hard task to wake up early, but you know the perks are unlimited! Don't you think it's really worth it!!! Now it's your turn to beat your alarm snooze and wake up. Don't give me that excuse again!